Over the last two decades, we have built a range of turbines that generate 600 KW to2100 KW. These turbines continue to generate power across the world, supported by our services. While we no longer manufacture turbines from our classic fleet, we continue to offer maintenance to ensure that our customers’ assets run smoothly. Moving wind turbine components from the factory floor to the project site, which is often remote and offshore, is not easy. It involves handling sensitive and valuable components that can extend to well over a hundred feet in length and can weigh several tons. Airflows can be used to run wind turbines. Modern wind turbines range from around 300 Watts to 5 Mega Watts of rated power for domestic and commercial use. Although turbines with rated output of 1.5-3 MW have become the most common option for commercial use; the power output of a turbine is a function of the cube of the wind speed, so as wind speed increases, power output increases. Emergent Ventures India Pvt. Ltd.
We can reduce costs and improve efficiency for our clients with our tailor - made client - specific solutions. Contact us today to find out how we can provide a customised solution for you ! 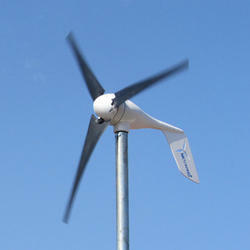 Total solutions for buying or selling of New or Pre-Owned wind turbines. Identifying and selection of the prospective buyer/seller to get optimum value and conclude yourdeal in a transparent manner. Inspection including a written report for the real condition of the turbines.